During the renaissance the words “grottos” or “caves” were used to describe antique structures in ruins, covered in vegetation, the insides of which were accessed to escape bad weather as if they were natural cavities. With the term “grottos” in this case we do not mean natural cavities, but the ruins of the most imposing roman villa in northern Italy, and it is placed on the southern coast of Lake Garda. It “probably” belonged to the famous latin poet Caius Valerius Catullus (passed away in 54 b.C.). The relation to Catullo (Catullus) is ascribable to a few verses this latin poet of veronese origins wrote, as in his songs defines Sirmione as a jewel among all the islands, peninsulas, lakes, and seas. 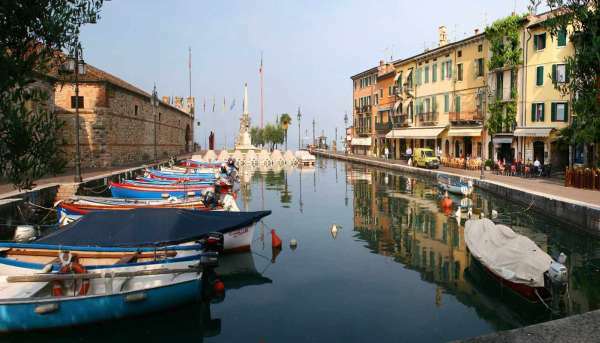 From the historical town centre of Sirmione, only accessible by foot, “Catullo’s Grottos” are reachable with a reasonable walk (roughly 20 minutes) or, during the summer months, with a small electric train by purchasing a ticket. 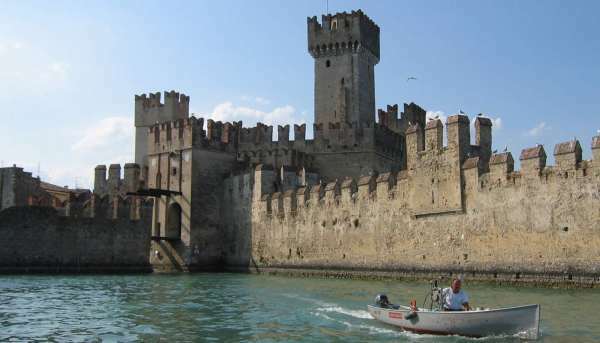 However, the most privileged observation point of the entire complex is definitely by boat excursion around the Peninsula of Sirmione, directly from the lake. The magnificence of this imposing roman structure can only be truly appreciated from this perspective. The Roman Villa was built around the beginning of the first century a.D. and, even if the time period and reason for the villa’s decline are unknown, the findings of tombs, both inside and outside the building, date back to the fourth and fifth century a.D. and point to the fact that by then the structure was already abandoned and turned into a mine to extract ancient stones to use as building materials. The ruins of the roman villa were re-discovered and described by chroniclers and travellers already in the 16th and 17th century, but the first studies on the ruins were only done in 1801 by one of Napoleon’s generals during the campaign in Italy. In 1856 Girolamo Orti Manara published a report containing all the studies and observations done during the excavation, finally recreating a blueprint of the place. Catullo’s Grottos are placed in a splendid and panoramic position both directly facing and above the lake, inside a big archeological park over 20.000 sqm wide, preceded by the Antiquarium, where the various archeological findings from the excavations are kept. Walking through the archaeological park of Sirmione you can have a taste of the thriving nature surrounding it and the extraordinary view of the lake. According to a tradition that dates back to the year 1500, this complex is identified as the most magnificent private building of noble character present in northern Italy! Another important piece of information are the beaches surrounding the peninsula, the most famous of which, on the northern side, is Jamaica Beach. It can be easily reached by boat or by foot, but the latter can only be done when the water level is low. It is a free to access beach and it is very stunning, due to its enormous and imposing slabs of pale rock emerging near the surface of the water. The water here also has a crystal clear and light blue colour, resembling Caribbean waters! Could this be where the name Jamaica comes from?